"We, the members of the Bricklayers' local union No. 1 of Kansas City, hereby refuse to buy meat of any kind for thirty days." The bricklayers' union has a membership of 138. There is another union in Kansas City, Mo., and also one in Kansas City, Kas. The other unions have been invited to join in the movement and action will be taken in a few days. The bricklayers of No. 1 union have extended an invitation to the organizations of other crafts to join in the movement. "We are prompted in adopting the resolution by a recent similar movement in Cleveland, O., which resulted in a material reduction of prevailing prices. "We bricklayers work on a scale of 70 cents an hour. This is generally considered high pay, but when it is understood that we lose a great deal of time, our wages are brought to a normal workingman's standard. "There are but few bricklayers in our union who feel that they can pay the present high price for meat. We have our own vernacular for certain meats. A 'bricklayer's turkey' is an ordinary undressed rabbit, fresh from the Kansas shortgrass, for which we pay 5 cents. A 'bricklayer's steak' is a small piece of liver. Even these meats are becoming so costly that we are willing to forbear their pleasures for thirty days. "If the other crafts will join us in our movement, we believe the result will be the same as that attained in Cleveland, and that meat prices will be reduced within the reach of all." "It's 12 o'clock," said "Billy" Campbell, electrician at the Hotel Baltimore. Frank J. Dean, manager of the hostelry, whose hand was on one of the big switch levers, gave it a pull, and in an instant the lights in the five dining rooms, the Pompeiian room, the grill room and the lobbies were extinguished. Bands in the dining rooms struck up "Auld Lang Syne," 1,200 diners blew souvenir horns, congratulated one another, and the new year was on. Capacity crowds filled the dining rooms and cafes of the hotels and restaurants of Kansas City last night. At the hotels the lights were extinguished for a minute at midnight to indicate to the diners that the new year had been born. Special orchestras furnished the music and at most of the hotels the old Scotch refrain was sung. The crowds this year were larger than last. The hotels began making reservations for last night over two weeks ago. A week ago practically all of the lists had been filled. Even at that, last night found hundreds at the big hotels, who waited in lobbies for an opportunity to get into the dining rooms before midnight. A check system similar to that used in theaters, in which the tables were numbered and the diners held numbered checks, was inaugurated at the Hotel Baltimore this year. This avoided confusion. After dinner scores of men were put to work on the dining rooms. The tables were arranged for their guests and the decorations were put in place. The favors or souvenirs consisted of horns, in the base of which were bits of confections. The color scheme was red, roses and carnations being used in the decorations. The doors to the dining room were opened at 10:30, but dinner was not served until 11:30. The dinner was timed to last half an hour, with the service of coffee on the tables just at midnight. Orchestras were hidden behind banks of palms and ferns in the dining rooms. The largest crowd was in the Pompeiian room. It was also apparently the jolliest. Long before midnight hundreds of would-be diners thronged the lobby and pleaded vainly for room in one of the dining rooms. As the midnight hour approached the doorways were crowded by those who would look in, even though they could not cross the portals. The balconies above the marble room and the main banquet hall were crowded early in the evening by those who could only watch the revelers. At the Savoy hotel the dining rooms were thrown together and the orchestra was placed in the hall so that the grill room, with its quota of stags, could be entertained. Dinner was served here at 11 o'clock. At 12 o'clock the lights were extinguished and the familiar Scotch melody was sung. The Hotel Kupper dining room was crowded an hour before midnight and those who could not gain entrance filled the lobby and joined in the chorus of "Auld Lang Syne" when the lights were turned up after midnight. At the Sexton hotel the crowds overflowed the dining rooms and were taken care of in the grill room in the basement. The actors and actresses about the city had their celebration at the Century hotel. Immediately after the curtains were rung down at the various show houses a rush was made for street costumes and the members of the "profession" gathered at the Century hotel. The tables had all been reserved, and an orchestra greeted the crowd from each theater as they appeared. The cafe of the Coates house held a capacity crowd. It was quieter than those at the other hotels. At the Densmore, the tables in the dining room had been reserved for several weeks. Scores were turned away last night. Special music was the rule here also. The large hall at 1416 Oak street, occupied by the Volunteers of America, was crowded to its utmost capacity last night when Major R. A. Davis, who recently took charge of the institution, opened the New Year's eve services with prayer and song. Between 200 and 300 men, women and children of the poorer classes enjoyed the entertainment of songs and New Year's recitations. A large tree, around which were piled the treats of the evening, stood at one end of the hall. Each one present was given a bag containing oranges, candy, nuts and cakes. "We will serve coffee and rolls after services Sunday night," said Major Davis. FOUND DEAD IN A CELLAR. George Dixon, 66 years old, living in the Metropolitan hotel, was found dead in a cellar under the Last Chance saloon, Bridge street and Broadway, yesterday morning. Dixon, who cultivated mushrooms in the cellar, did not return to his home on Tuesday night, and his wife requested the police to make a search. Coroner Harry Czarlinsky was summoned and after pronouncing death to be due to heart failure, ordered the body sent to the Carroll-Davidson undertaking rooms. Nimble fingers, hastened and made dexterous by kind hearts, effected a transformation in Convention hall yesterday, and today the great auditorium is a Santa Claus land for the poor children of Kansas City. At 1 o'clock this afternoon the doors of the hall will swing open for the mayor's Christmas tree, and at 2:30 they will close, while Santa Claus distributes Christmas presents to at least 7,000 little boys and girls who, by force of circumstances, might otherwise have had no Christmas. Notwithstanding unceasing efforts, the committees of the Mayor's Christmas Tree Association have been unable to locate all the poor children in the city to give them the tickets which are necessary to entitle them to gifts, and these children who have been overlooked are asked to apply at Convention hall this morning from 8 o'clock until noon. Tickets will be supplied these children any time between those hours. The Fraternal Order of Moose caught the Christmas spirit in earnest yesterday and notified the Mayor's Christmas Tree Association that it would have twenty-five wagon loads of coal at Convention hall at noon today for distribution among poor families. Each wagon will contain two tons of coal. Poor families who need fuel are requested to notify the mayor's office by 'phone or in person up to 11 o'clock this morning. These cases will be investigated and if the applicants be found worthy the coal will be delivered at their homes at noon. The offer from the Order of Moose was made by W. A. McGowan, secretary of the local lodge. That the Convention hall association is heart and soul in the Christmas tree project was shown when Manager Louis W. Shouse and the directors placed the whole Convention hall force at the disposal of the Christmas Tree Association. As soon as the railroad ball was over Wednesday night, Manager Shouse put a force of men to work taking up the dance floor and before 6 o'clock yesterday morning the building was ready for the decorating committees of the Christmas tree. Steve Sedweek was the first of the association workers to appear on the scene. He arrived at 6 o'clock and within a short time a large force was at work, setting up the Christmas trees, decorating them and packing the gifts into sacks ready for distribution. The committees worked all day and this morning they will have the hall ready for the great event. That the people of Kansas City may inspect the work of the "best fellows" a general invitation is extended to any who care to do so to stop into the hall during the morning hours, up to noon today. Among the busy people at the hall yesterday were Captain John F. Pelletier, A. E. Hutchings, Steve Sedweek, Captain W. A. O'Leary, Hank C. Mank, the Rev. Thomas Watts, Gus Zorn and a Mr. Bennett of Wichita, who is here to gain ideas for a similar event to be inaugurated in his city next year. Among the most valued workers were the members of the committee of twenty. Their duties consisted of the packing and arranging of the gifts in sacks. They worked from early morning till late at night and ate luncheon and dinner in the hall. Mayor T. T. Crittenden was present at the luncheon and sat at the head of the table, commending the women for their work. The workers were assisted by seven men from No. 6 hook and ladder company, Thirty-first and Holmes, detailed for the duty by Fire Chief John C. Egner. Chief Egner had intended detailing twenty men, but the fire in the Rialto building made it impossible for him to do so. The giant Christmas trees, which will be among the objects of chief interest to the children, were decorated in magnificent fashion by the employes of the Kansas City Electric Light Company and the Webb-Freyschlag Mercantile Company. The presents for the children will be arranged in sacks bearing the inscription, "Mayor's Christmas Tree, 1909." The sacks for the boys will be placed on the east side of the arena and those of the girls on the west side. The sacks for children up to 8 years of age are printed in blue and those of children from 8 to 12 are printed in red. Each child will receive two suitable toys and candy, nuts and fruit, all arranged in Christmas style. The programme for the mayor's Christmas tree will be a simple one. The doors will open at 1 o'clock, when the children can come in to feast their eyes upon the great Christmas trees and enjoy a fine musical entertainment. The doors will close at 2:30, so that it will be necessary for the tots to be in the hall by that time. Preceding the distribution of the presents, the Eagles' clown band will give a dress concert on the arena and a large electrical organ will also furnish music. Old Santa Claus, who, it is said, resembles very much in appearance Captain John F. Pelletier, will be present and he will have six assistants with him to mingle among the children. At 2:30 o'clock Santa will introduce Mayor T. T. Crittenden, who will make a short talk, and the presents will then be distributed. "We have plenty of funds and plenty of gifts for all the city's poor children," said A. E. Hutchings, "and if they do not come and get their share it will not be the fault of the committees, which have labored incessantly to get in touch with every child entitled to the pleasures of the tree." Although it was announced that no more funds were needed, and that no further cash donations would be received, the financial committee of the association was forced to decline donations yesterday to the amount of several hundred dollars. GAVE THE MAYOR A CAKE. Mayor Crittenden admits that he was 46 years old yesterday. His official family and close personal friends took advantage of the occasion to present him with an ornamented cake weighing twenty-five pounds. It was pyramidal and decorated with cupids, bon bons, and images of flying doves. The pyramid was shaped as a bouquet holder, and this was filled with American Beauty roses, ferns and delicate plants. At the base of the cake forty-six miniature candles were set in the open petals of lillies of the valley. While the mayor was absent in another part of city hall the cake was smuggled into his private office, and when he returned he was greeted by a host of friends, and Frank Lowe made a facetious speech of presentation, and the mayor responded as well as his embarrassment would permit. The three youths, Louis M. Dye, Ralph A. Clyne and Harry Shay, locked up in the county jail charged with highway robbery and suspected of the Spangler murder, were subected to a series of rigorous examinations yesterday by Assistant Prosecutor Norman Woodson. His efforts in "sweating" the prisoners so far have met with no success. The trio deny every charge made against them and with the exception of numerous identifications, the authorities have obtained no evidence that might help toward conviction. The matter is at present entirely in the hands of the prosecutor's office, the case having been taken from the police department. Shay is profuse in assurances that he knew nothing of the robberies with which he is charged. "Of course I am innocent," he says, "but these people whom I never saw before coming in and identifying me a criminal naturally makes me worried. A man swore yesterday that I had held him up at 10 o'clock on the night of December 2. At that time I was a a theater with a friend who can swear to it." Mrs. Nora Dye, the bride of Louis Dye, visited him yesterday. She remained only a few minutes. Beyond stating that he is innocent, and that he can account for every evening that he had spent away from home for more than a month, Dye refused to talk. Ralph Clyne is the most talkative of the three. He is in a cell on the third floor of the building in the woman's department and is far more comfortable than his fellow prisoners. He is cheerful and jokes about his surroundings. "Yes, I'm in the state quarters up here," he stated. "I can give an account of myself on the occasion of all these hold ups. Before I was arrested I never even knew the names of Dye and Shay. I sued to see them in the morning when I came to work and that was all. I certainly never went any place in their company." His mother, Mrs. M. Clyne, paid him a visit. "Cheer up mother. I'll be out of here in a week," he told her after kissing her affectionately. "It's no disgrace to be locked up when you are innocent." Mrs. Clyne had brought him a big package of fruit. "This is like money from home," he said as the jailer pushed the oranges and apples through an aperture in the cell. "I missed your hot cakes this morning at breakfast." Three more complaints of highway robbery were filed against the prisoners yesterday, and a further examination will be made and more statements taken this morning. COAL RANGE INTO ITS OWN. The despised coal range has again been given its place. The big hotels, as well as the smaller hostelries, have pulled the old coal range from out of the dust under which it has lain for a year and the kitchen boys have been kept busy for the last couple of days shoving coal, removing the ashes and keeping the fires clean. The failure of the gas pressure means much to a cook in one of the big hotels, where the orders come fast and where the cooking is timed with mathematical precision. In several of the places the cooks burn gas solely, except for certain classes of chops and steaks, which are broiled over charcoal. The unfortunate who are in institutions and the unlucky who happened to be in jail yesterday were not overlooked Thanksgiving day. While a regular turkey and cranberry sauce dinner was not served at all places, on account of the high price of the bird, a good, wholesome, fattening meal was served, where turkey was absent. In the holdover at police headquarters there were forty prisoners, all but five men. when noontime arrived the following was served to a surprised and hungry bunch: Turkey and cranberry sauce, real biscuits and hot cakes, baked potatoes, hot mince pie and coffee with real cream. Out at the city workhouse there were 107 men and eighteen women prisoners to be served, too many for turkey at prevailing prices. They were all given their fill, however, of the following menu: Roast pork with dressing, baked Irish potatoes, bakes sweet potatoes, vegetable soup, cranberry sauce, pumpkin pie, coffee. A real turkey dinner with cranberry, baked potatoes, celery, vegetables, pie, and coffee with genuine cream was served to the 109 prisoners in the county jail. After appetites had been appeased the men and women put in the rest of the day singing old-time hymns. It has been truthfully said that no old-time hymn can be started in the county jail but that enough voiced immediately join in to make it a success. And they always know the words and the chorus. There were but seven children in the Detention home yesterday, but they were not overlooked. The matron saw that they were served with turkey, vegetables, mince pie, coffee, etc. At the Salvation Army Industrial home, 1709 Walnut street, fifty-five men, and employes of the institution, sat down to Thanksgiving dinner. "We had turkey, cranberries, potatoes, celery and other vegetables, bread and butter, mince pie, cake, coffee, candy, nuts and apples," said one of the men. "And we got all we wanted, too." The Salvation Army proper served no Thanksgiving dinner to the poor yesterday, as it makes a specialty of its big Christmas dinner. Baskets are also given out at that time. Wednesday and yesterday baskets were sent out to a few homes where it was known food was needed. Probably the happiest lot of diners in the entire city were the twenty little children at the Institutional church, Admiral boulevard and Holmes street. While they laughed and played, they partook of these good things: Chicken with dressing, cranberry sauce, sweet and Irish potatoes, celery, olives, salad, oysters, tea, apple pie a la mode, mints, stuffed dates and salted almonds. The dining room was prettily decorated with flowers, and Miss Louise Mayers, a nurse, and Miss Mae Shelton, a deaconess, saw to the wants of the little ones. After the feast all of them took an afternoon nap, which is customary. When they awoke a special musical programme was rendered, and the children were allowed to romp and play games. Those who had space left -- and it is reported all had, as they are healthy children -- were given all the nuts candy and popcorn they could eat. "I wist Tanksgivin' comed ever day for all th' time there is," said one rosy-cheeked but sleepy little boy when being prepared for bed last night. Over 200 hungry men at the Helping Hand Institute yesterday were served with soup and tomatoes, escalloped oysters, roast beef, celery, cranberry sauce, mashed potatoes, cream turnips,cabbage stew, bread, butter, pumpkin pie and coffee. Out at the General hospital, the convalescent patients were allowed to eat a genuine turkey dinner but those on diet had to stick to poached eggs, toast, milk and the like. A regular Thanksgiving dinner was served to the convalescent at all the hospitals yesterday. BENDER KEPT A COOK BUSY. Joshua Bender of North Caldwell, N. J., claims to be the champion buckwheat cake and sausage eater of the Orange mountain section. Bender sat down to breakfast Tuesday morning and ate sixty good-sized cakes and two pounds of sausage. He washed the meal down with six big cups of coffee. "If I'd been real hungry I don't know what I could have done," said Bender, "but I was out late last night." BOY AND DOG EAT TOGETHER. Two meals were sent yesterday to the cell occupied by Lawrence Hansen, 10 years old, the boy taken Tuesday to the detention home for truancy. One meal was for the boy; the other for his dog, Jack. The dog is given the exact bill of fare served his master. Lawrence will be held until next Monday, when he is to be tried before the juvenile judge. His dog will stay with him. The dog apparently enjoys the situation. He frisked around during the day and at night slept at the foot of his master's bed. As long as he is not parted from Lawrence, the dog seems happy and contented. BODY ON STOVE EIGHT HOURS. Had Prepared to Cook Noon Meal. Peter Gilberg, a stone mason, was found dead in his home, 815 East Twenty-second street at 8 o'clock last night by Matt Gleason, proprietor of a saloon at 921 East Twenty-first street, who sent Gilberg home ill yesterday morning. Dr. Harry Czarlinsky, deputy coroner, found that a hemorrhage killed Gilberg. Gilberg lived alone. He evidently was preparing to cook his noon day meal when he was stricken as uncooked fish and some potatoes were on the kitchen table. One side of the body was cooked from the heat of the gas stove, which had been burning for probably eight hours. Mr. Gilberg was a member of the Woodmen of the World and carried $1,000 insurance. The secretary of the lodge was called last night but was unable to tell who the insurance was made out to. Mr. Gleason's niece was married about two months ago to a union tailor but whose name was unknown to the uncle. The niece was married in Westport. The body was taken to the Wagner undertaking rooms, Fourteenth street and Grand avenue. posing of Ham and Bacon. George Teck, head of the firm of Teck, Waterman & Co., 411 Delaware street, wholesale dealers in cured meats, acted as his own detective and yesterday morning caused the arrest of an employe of the firm on a charge of larceny. For some time past Teck has been missing hams and sides of bacon from the stock. Early yesterday morning, according to his statement at police headquarters, he caught the man trying to dispose of a twelve-pound ham and a side of bacon. Taking him into custody, Teck marched him to headquarters and turned him over to the police. Home Made Jam Opened in Alley. A sweet-toothed burglar visited the home of Mrs. Earl Boyer, 4031 Flora avenue, last night. Mrs. Boyer was alone in the house, when she heard someone moving in the cellar. She notified the police. When the patrolmen arrived they discovered that a case of home-made jams had been moved out into the alley and several jars opened and sampled. The rise in the temperature, combined with a cloudless sky during the better portion of the day aided materially in increasing the crowd attending the American Royal Live Stock show and a conservative estimate yesterday placed the paid admissions at about 14,000. There was, by far, more congestion than on either of the previous days, and in some of the exhibitions it was difficult to move around without elbowing someone out of the way. The crowd was made up largely of visitors from the small neighboring towns, though there was a number of country people and a goodly sprinkling of city folk in the throng. The horses and poultry continued to be the mecca for the crowds and the barns in which they were exhibited were crowded all day. The cattle and swine also came in for a good share of attention, and, in fact, there was nothing on the grounds that was not visited by a fair portion of the visitors. The usual exhibition and parade was given in the pavilion during the afternoon. In addition to the Morris six, the Anheuser-Busch mules and the Clark ponies, Casino, the undefeated world's champion Percheron, was shown in the parade, together with $3,000 worth of medals which he has won in various parts of the world. Two accidents were narrowly averted in the arena. The first came when, through a mistake, some one opened the upper gate while the Anheuser-Busch mules were being exhibited. The animals thought it was for them to go through and they swerved toward it. The crowd beyond the gate made a rush to get out of the way but the driver, by a quick manipulation of the reins, managed to turn the leaders back into the arena and no damage was done. The second came in the chariot race in which Mrs. Georgia Phillips and Miss Fra Clark participated. At the second dash around, while the ponies were going at top speed, Miss Clark failed to make her turn short enough and the pole of her chariot almost crushed into the one occupied by Mrs. Phillips. Quick driving on the part of the women prevented an accident and the race was finished amid a storm of applause. The barkers were out in full force yesterday, much to the delight of the rural housewife. There were apple parers that could be utilized in a hundred different ways, can openers, milk skimmers, knife sharpeners, and in fact, all descriptions of household gimeracks which could be purchased from ten cents to a quarter, and nearly every farmer's wife availed herself of one or more of the implements. The candy paddle wheel man was also in evidence, and he did a rushing business. The feature which appealed largely to the country brethren, though, was a hill-climbing automobile demonstration. A runway sixteen feet long, built on a 50 per cent grade, was erected and the car, in charge of a competent chauffeur, would, like the French general, go up the hill and down again. There was no charge for riding and many a love-lorn swain and his sweetheart from the rural districts enjoyed their first auto ride. From a financial standpoint the women of the Jackson Avenue Christian church have the very best proposition on the grounds. They are operating a lunch stand where hot soup and coffee, together with other edibles, can be obtained on short notice at a moderate sum. The place is crowed all the time, as the air chilled one in the barn and the soup and coffee are used to "heat up." Of course there are some who do not heat up on soup and coffee, but they seem to be in the minority, and the church women reap a harvest, between those getting warm and those really hungry. The Kellerstrass farm of Kansas City, which has a large exhibit in the poultry barn, after the first of the year will add a new industry to its line, that of raising fancy pheasants. The farm has been experimenting along that line for some time and the past year raised 700 pheasants. This decided them that it could be done successfully, and after January pheasants will be listed in the Kellerstrass catalogue. The birds will be sold only to fanciers. Many of the owners in the horse barn have decorated in a most handsome manner, the stalls allotted to them. Among these are the McLaughlin and Robinson exhibits. They have their stalls in white, green and yellow bunting, together with the cups, ribbons and other trophies, won by their animals, over the stall occupied by the horse which won them. The effect adds beauty to the barn and is quite pleasing to the visitors. The sale of Herefords in the Fine Stock Sale Pavilion yesterday was attended largely. It began at 2 o'clock and continued until 5:30 at which hour fifty head had been disposed of at fairly good figures. 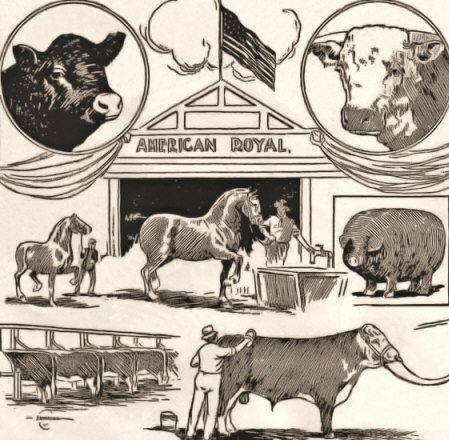 The highest price of the afternoon, $800, was paid by J. P. Cudahy of Kansas City to W. S. Van Natta of Fowler, Ind., for the bull Pine Lad 38th. The animal has one prizes all over the country and is an exceptionally fine specimen. The average price of the day was $166 1/2, which is $15 less that the average prices realized at the sale last year. There will be a sale of Galloways in the sale pavilion today, while in the show proper the judging of sheep will be started and several classes will be finished up. For throwing split potatoes, said to have contained notes for women prisoners, into the cellroom of the matron's department at police headquarters, Patorlman Arthur Dorset, who saw the occurrence yesterday afternoon, arrested Earl Lee and James Hastings of Liberty, Mo. The girls held in the matron's room denied knowledge of any notes. The men were locked up. Seated in a historic eating house in London three weeks ago, Henry Garland of this city heard a man specifically direct his waiter to bring him "a Kansas City steak." Mr. Garland had written out an order for something else. He tore it up, looked in vain on his card for the "Kansas City steak," but could not find it. When his waiter arrived he duplicated the order of his neighbor, and was surprised that the waiter was not surprised. "What do you know about Kansas City steaks?" Mr. Garland asked. The waiter replied they were the special steaks of that particular eating house. "I found," said Mr. Garland, "that 'Kansas City steaks' were as well established as Maryland terrapin is in the East. And why shouldn't they be? I never got a better steak in England than the "Kansas City steak' I got in that London eating house. I told my man why I specially wanted a Kansas City steak, being from there, and that interested him. He told me the steaks actually came from Kansas City. It was like a trip home for dinner to get one of those steaks. Incidentally, the waiter proved so intelligent that I asked him why on earth he did not pull up his pegs and come over here where he could make dollars instead of shillings. He told me he had a wife and five children and could not get started. He would not leave the kiddies, and that was a good failing on his part." Mr. Garland went to stay six weeks in England. He had two all-sunny days out of the six weeks. "Rain and the German war scare are the principal features of touring in England this summer," said Mr. Garland. "They are no more afraid of Germany then they are of Iceland, but that is the way they scare the people into higher taxes. We got up a Japanese war scare here four years ago to get money to the Dreadnoughts we are now building. England is playing the same game now, very effectively. A home made custard pie may be the innocent cause of William Miller spending several years in the Kansas penitentiary. Miller, according to his own story, yesterday afternoon entered the home of Fred Herwig, a farmer living near Barker station about seven miles west of Kansas City, Kas., on the Kansas City Western electric line. After securing three watches, a gold locket and chain and about $7.50 in money, he prepared to leave before any member of the household should return from a neighbor's home where they were visiting. Had Miller carried out his original intention of leaving the house at once he might have escaped detection, but the sight of a fresh custard pie on the table proved his downfall. He stopped long enough to wash his face and hands and then sat down and ate the pie. On his way to the car after leaving the house, he was seen by Mr. Herwig. Upon discovering his loss, Mr. Herwig telephoned the police in Kansas City, Kas., to be on the outlook for the thief. An officer entered the car at Sixth and State avenue and arrested Miller. Most of the stolen goods were found in his possession. Huddled with a score of Mexican refugees in a shack fourteen by sixteen feet for over thirty-one hours, while the wind blew with an average velocity of 100 miles an hour and the rain fell i n torrents, and standing during this time knee deep in water was the thrilling experience of Mrs. Robert Miller, a Kansas City bride of a few days on her honeymoon trip in the state of Tamaulipas, Mexico, during the recent hurricane and unprecedented floods there. Mrs. Miller, who was Miss Anna Belle Schell, her husband, Robert Miller, and Frank W. Hager of Kansas City, who are interested in a big land grant, and John B. Demaras and Demosthenes Lapith of Kansas City, Kas., were the only white persons in that territory for several weeks. During nine days of that time the party, cut off by the floods from roads and communication with the outside world, killed goats and subsisted on goat flesh. All reached Kansas City early yesterday morning, none the worse for their experience, and Mrs. Miller declares that she is ready to go again. The party experienced delightful weather until they got well into Mexico. Then it began to rain. They began having trouble at Victoria in getting to Soto La Marina valley, their objective point, which is about eighteen miles from the Gulf of Mexico. they arrived at the village of Soto La Marina on August 27 after riding for some ten miles through water breast deep on the horses. The path was picked up by a native who several times had to swim with his horse. On their arrival at Soto La Marina it became apparent that the town would be flooded by the rapidly rising river. It was raining heavily and the only refuge was on the hills west of the town. It would have been impossible to have returned to Victoria, so Mr. Miller and his party joined the native refugees. A quantity of food was hastily gathered and as the water began to fill the streets the inhabitants abandoned the town. The trip to the hills, about fourteen miles, was accomplished with difficulty. Frequently the horses would splash into holes and all of the riders were soaked to the skin. "When we arrived at the shack near the junction of the Palma and the Sota La Marina river, which is the location of a proposed townsite, the rain was coming down in torrents, and the word torrent means just what the dictionary says it does down there," said Mr. Hager, one of the members of the party. "There were several adobe huts and to these the Mexican refugees hastened for shelter. Some joined us in the shack, which was built of up-ended logs with the chinks plastered with mud and a thatched roof, tied down with the native cord, formed of pieces of stringy bark. "The way the house was tied together is about the only thing that saved us from the merciless wind and rain that night. It began to blow up about 11 p. m.
"Wind gauges at government stations broke after recording velocities of 124 miles an hour, and I believe that the wind traveled just a little faster where we were. "There were a score of us in the shack. The water swept through from the hillside until we stood almost knee deep. We had no light nor fire. We had some tortillas which kept us alive. About 7 a. m. the wind died down and for half an hour there was a perfect calm. "Suddenly with a shriek the wind turned from north to south and blew as strong or stronger from that direction. Of course there was no such thing as sleep. The natives prayed constantly and the women bemoaned their fate. We knew of course that we were in no immediate danger, but we were in constant fear of our little shelter being blown from off our heads. All that day and the next night the storm continued. About 6 a. m. the sun came out the greater part of our stay there. "When the storm abated we began to look for food. Someone espied some goats on a hillside. We gave chase and an hour later had a nice goat roasting on a spit. That meal was the best I had eaten for some time. "We were on a slight knoll, and after the meal we started to look around. We were practically surrounded by water, except for one outlet around an almost impassible mountainside dense with tropical verdure. We could do nothing but wait for these waters to subside. We slept on the ground. Saddles were our pillows. For nine days we lived the lives of savages, subsisting almost entirely on goat meat. I thought at one time I liked goat meat, but I got enough to do me the rest of my life. "We finally made the start South. Natives went ahead and with knives and axes cut a path along the mountainside. A forty-mile ride under those circumstances was not the most enjoyable pastime in the world. When we arrived at Paddua there was but one hotel there, and it had one room which had been left with a roof. "This room, of course, went to the bride and the bridegroom. The rest of us made ourselves comfortable on cots with the blue sky overhead. "About midnight I was awakened by the patter of rain drops on my face. I was sleepy and pulled the blanket over my head and slept until I found myself resting in several inches of water. The rain ceased an hour or so later and after dumping the water out of the cots we all went back to sleep. It was much easier from there on home, as we found good accommodations at Tampico. "One of the most remarkable things to us is the fact that although the five of us were wet to the skin for two weeks and slept out on the ground during the greater part of that time, not one of us felt any ill effects. We were chilly at times, it is true, but that wore off and not one of us caught the slightest cold or felt any inconvenience. I gained four pounds. Mr. Demaras gained eight pounds and the others in the party all put on some flesh. The board of pardons and paroles took occasion yesterday to issue its first orders governing the future conduct of affairs at the workhouse. the new orders, or rules, were submitted by Secretary L. A. Halbert and approved by the board. They are taken from rules governing houses of correction in Chicago, Ill., Cleveland, O., Elmira, N. Y., and Boston, Mass. "General order No. 1, section 1," reads" "At no time will cigarettes, cigarette tobacco or papers be permitted in the workhouse, and the smoking of these harmful things by both men and women prisoners must absolutely be prohibited." Section 2 permits the men prisoners to have chewing and smoking tobacco, but pipes must be used. Section 3 puts a ban on food, fruit and delicacies being sent in to prisoners by persons on the outside. that custom has been in vogue here ever since there was a workhouse, and the board is informed that this is the only city that permits it. Hardly a day passes that baskets or packages of food or fruit are not received for prisoners. Joseph Mackey is one prisoner who, it is said, does not know what workhouse "grub" tastes like. All his meals come from the outside. "Prisoners are not allowed to have food in their cells," explained President William Volker, "consequently it was placed on the dining table for them. It is not fair to have a few eating choice viands while the majority of prisoners have to look on. Prison fare is as good for one as another, and should be part of the punishment." Secretary Halbert was for abolishing tobacco in any form. He never uses tobacco. Neither of the male members of the board are tobacco users but they, with Mrs. Kate Pierson, compromised on abolishing cigarettes. Prisoners will also be permitted to send out for candy, chewing gum and a small amount of fruit which they may have in their cells. Hereafter prisoners will not be permitted to carry any money or jewelry into their cells with them. Deposits will be made with the clerk. If a prisoner sends out for any of the permitted "luxuries" he will have to give an order on the clerk for the amount and that will be charged against his account. The board also is working on rules governing the conduct of guards and other employes at the workhouse. they have not been completed. A resolution discharging Joseph Etzel, a guard, was adopted. A prisoner complained that Etzel had abused him. This is the second time the board has dropped Etzel. The first order appeared to have no effect as he kept on working. During the recent work house investigation Etzel was accused of attempting to intimidate a witness for the board. he was peremptorily ordered dropped. Why he retained his place no one on the board was able to explain. The ordinance giving the board charge of the workhouse gives it the right to hire and discharge guards. It was said yesterday that Etzel is "out for good" this time or the board will know the reason why. When Superintendent Cornelius Murphy informed Etzel that he had been discharged the guard went before the board. "I haven't done nothing to nobody or violated no rules here and I demand to know why I'm fired," he demanded. "We don't think you have the proper influence in a place like this," Mr. Voelker informed him. "My influence is as good as any of 'em," stated Etzel, proudly. "I have as good backing as the best." "I am not speaking of political influence," replied the president. "We do not consider you a fit man for the place. I do not care to discuss this matter with you further." Another guard, who was reported to have been involved in a romance with one of the girl prisoners, a sewing machine girl, was called in to explain. He denied being in love and insisted he had made no arrangements to pay the woman's fine. He was told to return to duty. Five male prisoners and one woman were ordered paroled yesterday. Several applications were deferred until further investigation could be made. The board made a rule that a prisoner could not receive visitors until they had been there fifteen days. After that the relatives may visit on Sundays only. THEY KICK ON THIS MENU. ter, Milk, Coffee, etc. for Prisoners. Men who are confined in charity institutions, jails and workhouses are prone to complain of their treatment, and it is proverbial that they always object to the food. Kansas City is no exception in this regard, the latest kick being from men brought back from the municipal farm at Leeds and confined in the workhouse or released. One kicks on the quality, another on the quantity, or rather lack of quantity and various other protests, mild and vociferous, have been registered. Yesterday Edward Kipple, Daniel Mahoney, Harry Fry, Lee Garrett and Albert Buell, guards at the workhouse, took eighteen prisoners to the Leeds farm. That makes forty-seven men now sojourning there. Evidently while a the farm the five guards dined. They did not have a special spread but "the staff" ate with the forty-seven prisoners. "To begin with," said Kipple, "I will give you the bill of fare for supper last night. Fried country ham, good ham, too; fine fried potatoes, cooked peas, hot biscuits, hot corn bread, old fashioned home made bread, the kind 'mother used to make,' apple sauce, as good as any human ever tasted, fresh country butter, made on the ground; coffee and sweet milk, also secured on the farm. "We were all at one table and I was a little leery that the boss was putting up a spread just for our benefit. I asked a prisoner at another table, 'Hey, fellow, what are you eating over there?' 'Just the same as you are,' he replied. Still not satisfied, I got up and went over to take a look for myself. Sure enough, they had everything we had all the way down the line." IT WAS A HYBRID PRODUCT. "I've lived long enough in Missouri to have to be shown," said Ed Winstanley, purchasing agent, yesterday, when H. C. Liepsner remarked that in his garden he was growing succotash. "On the same cob corn and lima beans are growing in alternate rows," said Liepsner. "Show me. Bring down a sample," replied the doubting Winstanley. Yesterday Liepsner made good. He brought to the city hall a cob showing alternately rows of corn and beans. "That stumps me," confessed the confiding Winstanley, and he really displayed some temper when Liepsner began pulling out the beans, to show that they had been inserted by him. So that he could enjoy the cooking of his youth the Rev. Father Joseph Uhli of Wilson, Kas., sent all the way to Germany for Miss Anna Gilbert, the woman who cooked at his father's home and who is now to be installed as the private housekeeper at the parochial residence. She arrived at the Hotel Baltimore yesterday where she was met by Father Uhli. He escorted her to her new home in Kansas last evening. The Rev. Father Uhli came to this country from Germany three years ago. H e was ordained in the old country and when he came here was assigned to the parish at Wilson, Kas. He is a young and energetic priest and has popularized himself with his parishioners. Many improvements have been made in his parish since he took hold. Though his parishioners did everything possible to make his life pleasant, he lacked one thing. That was the cooking he had been accustomed to in the "Fatherland." There was not that flavor to the food which he thought it had when he lived at his father's home. His letters to the old country told of how he longed for the old home cooking and then it was that Miss Gilbert, who had cooked in his father's home for years, declared that she would like to go to America and to keep house and cook for the priest for whom she had cooked when he was much younger. The proposition to have Miss Gilbert emigrate to this country took definite shape a few months ago. Father Uhli gave her explicit instructions and she arrived in Kansas City yesterday morning and went at once to the Hotel Baltimore. There she was met by Father Uhli. It was the first time that she had been in a large hotel, and owing to her ignorance of the English language, it was necessary to send an interpreter to her room when she ordered her dinner. Miss Gilbert was greatly worried yesterday afternoon over the absence of her baggage. There had been some delay in forwarding it. Father Uhli spent several hours in endeavoring to trace her effects. "Miss Gilbert was raised in our family," said Father Uhli. "She was our cook when I lived at ho me and when I came over to this country she expressed a desire to come here also. I have been without a housekeeper at my parish and I decided to send for Miss Gilbert, whose cooking I distinctly remember. She longed to come to America and quickly consented to come here and keep my house for me." It was stated yesterday by Ensign Blanche Heazlitt of the Salvation Army, who has charge of the penny ice fund, that more than 400 poor families are now being supplied by that means. The ice distributed in two sections of the city is donated. In the East Bottoms it is donated by the Kansas City Breweries Company through the Heim brewery. In the West Bottoms the Interstate Ice Company gives five tons each day for distribution in that section. "For the North End, the McClure flats, Warden court and for the homes of many needy intermediate families," said Ensign Heazlitt, "ice is purchased out of the penny ice fund. We are still able to give ten pounds for a penny, and on Saturday we allow them to purchase twenty pounds, as there is no delivery on Sunday. "The ice so delivered is not to be cracked up and used in drinking water. There are babies at most of the homes and it is used to keep their milk cool and sweet and to preserve what little else perishable the family may have. At first many of the mothers were wasteful, not knowing how to preserve ice, but I made a trip through the penny ice district and taught the mothers how to keep it by means of plenty of old newspaper and sacks. "Some of them have made rude ice boxes which enables them to keep the ice longer than before. By next year we hope to have depots distributed throughout the district where ice may be secured. "I have often wished that the subscribers to the fund could have gone with me on my trip. They would be delighted to see the good their money is doing. We consider penny ice the best thing that has ever been done for the unfortunate of this city. Many of the mothers cannot speak English but they all show their gratitude in their worn, wan faces. "Next year we want to be able to start out the wagons in time to supply the unfortunate just as soon as warm weather arrives. There is no doubt that the distribution of ice has saved the lives of many helpless little ones this year."